In this episode of the eLife podcast we hear about drug production, early career researchers, honeybees, human migrations and pain. 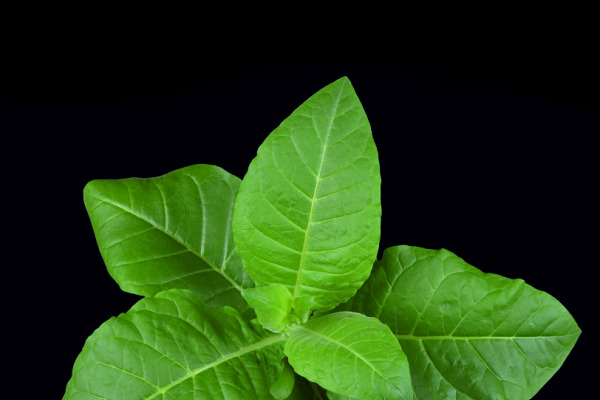 A new way to produce a malaria drug using tobacco plants. Ralph - This compound is called artemisinin. It is produced by a wild plant called Artemisia annua. This plant makes it in very low amounts and this plant is not easy to grow. We tried to take the pathway out of this wild plant and put it into a high biomass crop which was the tobacco plant. Chris - Do we understand the pathway by which the sweet wormwood - the plant that naturally makes artemisinin - actually makes it? Ralph - We know the key enzymes. There are additional proteins involved in regulating the pathway. This regulation is not so well understood. That was a reason why we played a lot with different amounts of this additional proteins that are involved in controlling how much is made at the individual steps in the reaction cascade. Chris - How much is made since you raise that point and why does the plant - the sweet wormwood plant - make it in the first place? Ralph - It is actually not really clear why the wild plant is making this compound. Many of these metabolites in plants are made for defence reasons. Against insects, pathogens like viruses and bacteria, but in this particular case, we don't really know. Chris - Is it expressed universally through the plant or is it expressed only in small restricted areas? Ralph - Now unfortunately, the wild plant makes it in the so-called trichomes. These are little hairs at the surface of the leaf. This is one of the reasons why the amounts that are naturally produced in the plant are rather low. Chris - So therefore, you've got two problems to solve. One is not just getting this into a cropping plant but also, getting it to be expressed in sufficient quantities in that plant. Ralph - Exactly. That was the goal of our project. We wanted to take the pathway, put it into a high biomass crop and try to have it expressed uniformly in the entire plant. Chris - What was your approach? 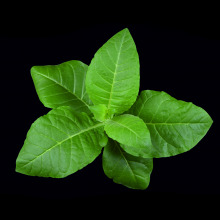 Just literally get the genes out of the genome of the wormwood plant and put them into tobacco. Ralph - We took a two-pronged approach. The structure that we targeted where we wanted to implement the pathway is the chloroplast. The chloroplast is the structure within the plant cell where photosynthesis occurs. So photosynthesis is the process in which the plant converts light energy into chemical energy. Putting biochemical pathways into the chloroplast has certain advantages over putting it elsewhere in the cell. One advantage is that there are many chloroplasts in the cell and many copies of the chloroplast genome of the genetic information of the chloroplast in each of these chloroplasts. This has the advantage that the amount of protein product that is made from a gene is usually much greater when we put the gene into the chloroplast genome compared to the nuclear genome. Chris - How much artemisinin comes out from one of these transgenic plants now, compared with the parent sweet wormwood? Ralph - The compound we are making is not exactly artemisinin. It is the immediate precursor of artemisinin called artemisinic acid which however can be converted into artemisinin by a relatively simple chemical reaction. In the amount that we've reached so far in our best producing plants is approximately 120 milligrams per kilogram. It's probably not yet sufficient for large scale commercial production but we think there is room for further improvement. Chris - But haven't other people previously expressed the same families of genes in yeast and therefore been able to make this artificially just in yeast and then you don't have that problem. Ralph - That's correct. It can be produced in yeast, the same compound - artemisinic acid. However, yeast production has the disadvantage of requiring expensive production sites where these yeast cells can be cultivated. The advantage of making it in plant is that plants just need water and sunlight to grow. So potentially, production in plants is much cheaper than production in bacteria or induced cells. Is science at risk of losing talented researchers to other professions? Alik - The career difficulty facing young scientists and young academic engineers are probably greater than they have been really in the history of the modern scientific enterprise. This is having some very negative but also very difficult to perceive effects on society and on society's technological progress. Chris - Well, let's put some numbers on this then. In real terms, what's the scale of the issue? Alik - To give you a perspective and these are somewhat new eccentric numbers. Since the year 2000, there has been effectively a 50 per cent decrease in the number of research grants awarded by our major funding agency or the national institutes of health. Broadly for my country, the problem is that we've got a drain of the workforce. 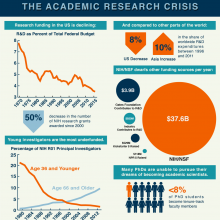 In 1980, over 20 per cent of scientists holding a major research grant were under age 36. Now, that number has dwindled to 1 to 2 per cent. In right around the 1998 mark, the percentage of major research grant holders who were over age 66 actually crossed and now is approximately 5 to 10 times more than those who are young investigators. There is a whole generation of emerging scientists who are quitting the profession who were unable to launch their labs, begin their careers and we are losing everything that those people might have created. Dr. B - The year I finished my PhD, my adviser won a major national award based partly on my work. They called it genius and incredibly innovative. I finished my PhD, spent a few months on a lab to wrap up, and then took my first faculty job at a university across town which was pretty normal for my field. They were excited to hire female engineer. I felt proud of my work. But then, when I tried to take the next step, the funding dried up. The NIH said it was too pre-clinical and the study section wasn't sure it would work. The US National Science Foundation said it was too clinically oriented. Career award reviewers at both agencies felt there wasn't enough evidence of university financial commitment because technically, I was in a soft money job. Nobody was willing to take a risk. We struggled by and I kept applying. I eventually learned that about a half a million US dollars in grants over 6 years, but all that time, I hated the panic of wondering if I will lose my job the next year for a lack of funding. I was on track as far as promotion in tenure was concerned. But even so, I resigned after those 6 years, using the excuse that my family and I had decided to move to another state. We never went. And now, I work full time at a technology start up. I miss the prestige of having a faculty position but I don't miss much else. Chris - So Alik, how do you react to that transcript? Alik - What we have is these people who are in the positions where they're supposed to be transitioning to their own laboratory, do a faculty job, to doing their own research. So the senior stage graduate student, the post doctoral scholar who's taken 1 to 2 years post PhD to gain a new skill, what they're seeing over and over again is their mentors and their colleagues do reasonable work, putting in the effort, writing a good proposal, really trying to sell, "Hey, this is my science. This is what it's going to do for the world. May I please have the resources to bring this idea forward?" And being told "No" and not being told "No" again, not because they're doing bad work but because there simply isn't enough to go around. In this situation, one of the things we're observing is that as a result of there not being enough resources to go around, the committees that review these grants had become extremely risk averse. They have really acquired a bias and a preference for funding persons who have previously been funded, who already have basically worked out most of the problem and are just continuing to polish the edges and making the solution shine a bit more and don't get me wrong - that's very good work. It's just that there's a large body of research saying the greatest creativity in science, the big breakthrough ideas, those discoveries come from the youngest minds who still are questioning assumptions and those are the people who are getting discouraged. Chris - Why do think and what has emerged in the discussions you've had as to why we're in this position because it's not unique to the US? I was in Australia recently. If you look at the success rates of grants in Australia, they're down in single figures, the UK has similarly precipitous grant funding situation. Why are we in this position? Chris - But if they're not spending the money on science, what are they spending it on? Alik - I would love to know that. In the United States, we have a problem of many hidden expenditures to the tax system. We essentially choose not to raise revenue from things we could and that is an expenditure by refusing to collect money. It's almost as though if you give a customer a product for free. But I frame it fundamentally as also a question of, what are we doing relative to what other nations are doing. And this is one thing that we see, is that while the relative share of research and development expenditures in the western world and the English speaking countries is going down, that of Asian nations is going up. In a world where I see so many of the western powers saying they're concerned about their geopolitical relevance, they're concerned about their economies, the fact is, if you want the engines of economic growth, it's these ideas and someone has to pay for them. One of the other points we made is, if you look at total industry spending on basic research and development, and you look at the size of what government does and again, it's US centred numbers, it's the difference between an Earth and a Saturn or a Jupiter. It's just fundamentally not even on the same scale. Protruding from the heads of most insects are pairs of antennae, which are decorated with nerve endings sensitive to cues like smells and pheromones. But, in bees and possibly other insects too, these antennae also serve another crucial role: in flight. Sanjay Sane at the Bangalore National Centre for Biological Sciences spoke to Chris Smith about the discovery. Sanjay - What we noticed was that insects position their antennae in a very precise way when they're flying. What we further noticed was that as you get them airflow, they begin to position their antennae farther. It does appear as if the bees are very concerned about where their antennae are. Antenna position itself is being influenced by airflow coming from the front as well as flow of the visual field across its retina. Chris - Now, if you look at other social insects - things like ants - people have in the last decade shown elegantly by chopping the legs of ants actually and sticking on pig bristles, the ants count their steps to work out how far they are traveling. Are you saying that these insects, things like these are using how their antennae interact with the air flowing past them to give them a gauge of perhaps how fast they're going. Sanjay - Something similar to that. What we are arguing is that insects have a sense of how fast they're flying because they're getting feedback from multiple sensors on their body. They're getting feedback from their eyes and they're getting feedback from their antennae. What they are able to do is calibrate across the centre. So they're using what's happening over one sense to calibrate what's happening across other sense. In that sense, they're similar to what the ants are doing with the step counting. 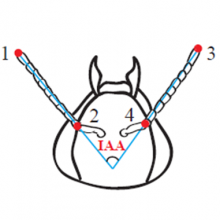 What ants are doing is looking at the flow of their retina and at the same time counting steps and they can then correlate one with the other. Chris - How did you actually do this study on these bees? Sanjay - We did it in two ways. The graduate student who worked on this, the graduate student who worked on this, trained bees to come into a wind tunnel inside the lab. And so, the bees had to fly across about 100 metres from the aviary to our window then walk across a little yellow tape and go to a field. While they were doing that, we could change the airflow in the wind tunnel and at the same time, film their antennae and then what we did was look at how in terminal position as a function of the airflow. Chris - And how are they positioned? Sanjay - The antennae positioned forward. The base of the antennae muscles and these muscles are causing the antennae to position forward as the bee experience this air flow. Chris - And so, this gives the bee the ability to compensate for forward air flow? Is it flies into the air or experiences ahead wind? It can adjust the position of its antennae. Sanjay - It adjusts the position of the antennae. Why it does it is not very clear. In their approved hypothesis, one is that they're trying to keep in the range of their sensitivity. The site of extremely sensitive organs on the antenna called the Johnston organs, what they're trying to do is sense the environment using these Johnstons. So, they would want to keep those in certain range of sensitivity. That's one hypothesis. The other hypothesis is to minimise drag on the antennae. Although that hypothesis can be discounted because we've also shown that as the scenery moves over its retina, the bees position their antennae backward. The resultant of these two opposite reactions is that the antenna stays more or less in place. Chris - So, that would fit with the idea that they are tuning the position of their antennae in order to sit there at the most sensitive position so they're getting the most accurate reading of how the air is interacting with their antennae as they fly. Chris - Quite neatly, what this does is it means that even if the bee is flying into a headwind - so there's an apparent wind because of it moving but then there's an additional wind effect - then because there'll be a disparity between what the antennae record and the what the eyes record, the bees can compensate for that, I would anticipate. Sanjay - Yes, that is exactly right. That's exactly what we think. Chris - And if you disable this mechanism, did the bees go off course? Sanjay - They cannot fly. They can try and take off, but they tumble and they fall and they simply cannot fly. The position of the antennae is a very necessary part of flight. George - Various studies have shown that humans left Africa something like 50,000 to 70,000 years ago and populated the world. Most of the ancestry in people alive today outside of Africa is the result of this main exodus. What we were interested in looking at was what the population structure within Africa looks like now. And in particular, how much ancestry might be the result of back migrations into Africa much more recently, so within the last 5,000 to 10,000 years. Chris - How do we know, George, that there was this mass exodus 55,000, 60,000 years ago in the first place? George - There have been several genetic studies that have looked at this and they've shown that the diversity that you see in Africa is much greater than the diversity outside of Africa, and the sort of most obvious reason that that would be is that there was a bottleneck which means that there was a reduction in population size as people left Africa. Chris - And that fits with the archaeology, does it? George - It fits with the archaeology as well and we're now starting to get ancient DNA. So DNA from long extinct hominems in fact like Neanderthals and all of this information is reiterating the idea that the majority of the ancestry from people outside of Africa is a result of this big exodus. Chris - So, where does the idea that people went out and then appreciable numbers came back again come from? George - Actually, for a long time, there wasn't any particular thought this is what happened. Much more recently within the last 3 or 4 years, there's been genetic evidence. What we really tried to do in this study was to try and systematically characterise this non-African ancestry and see if it is ubiquitous across Africa and where, and really try and work out when we think this ancestry might have come in to Africa. Chris - And you're using modern genetic techniques to do that. George - Yeah. We collected a whole load of samples from 48 different African populations. So, we've got these individuals of which there were about 2,500 in total. We compared them to 1,200 individuals from outside of Africa. We sequenced some of their DNA. So we looked at about 330,000 different places in the DNA. So the idea here is that if two people share identical stretches of DNA then these two people are likely to be closely related to each other. Chris - This means that you can trace sections or segments of genetic information coming into Africa from European populations. But equally, you can see where individuals or groups in Africa have been going because there will be chunks of DNA which have moved as populations have moved within Africa as well as you can look at both influx and intra-African migration. George - That's right. Most DNA that comes from Europe is efficiently different from African DNA that it's actually quite easy to spot the differences. But even within Africa, you can start seeing differences in relationships between people from eastern and western Africa and eastern and southern Africa, and western and southern Africa as well. So, we can begin to understand how these chunks of DNA have been moving around. Chris - Presumably, you can also get a temporal relationship there because the more dilute the signature becomes and the more diverse within the whole of Africa it becomes, the longer it must have been there. George - Yeah, that's right. So if you share a very long chunk of your DNA that really implies that our common ancestor was very recent. So, we can use that property of DNA to understand when groups might have been related in the past. Chris - Very hard question to put to you because this is a detailed paper which looks at a huge number of people and a huge continent. What were the real standout kind of things that you began to find when you did this analysis? George - One of the really big results from this is that we're really piecing together the different migrationary events that have affected different parts of Africa. European ancestry coming into west Africa, we see Asian ancestry coming in to east Africa at a slightly different time, around a thousand years ago. 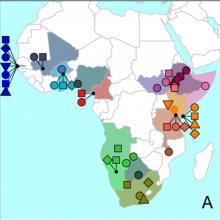 Also, we see movement of genes within Africa and in particular, these movements seem to be associated with the expansion of agriculture in Africa. Prior to about 5,000 years ago, the vast majority of people in Africa were hunter gatherers and it's only within the last 2,000 to 5,000 years that people have really started being agriculturists, and agriculture technologies were likely to have originated in central West Africa like where Cameroon is now. What we see is that there was certainly a movement of genes from central West Africa into southern and eastern Africa within the last 2,000 years. So what we're seeing here is real concrete evidence that this expansion really did involve the movement of people as well. So the vast majority of Africans, south of line between Cameroon and Somalia today can trace their ancestry back to this movement of people from central West Africa. Anjali - Imagine that you've just jammed your finger in the car door and you know you feel pain because your finger is hurting and you're bleeding. What we discovered in our work is that explains you've just had a feeling physical pain yourself does not share the same brain processes that will happen to you when you watch your best friend jam her finger in a car door. But you know that both of you have to feel pain. So the question we wanted to ask is, when you know that there seems to be some kind of overlap in the experience, when is there really an overlap in the brain and if there is, where is this overlap located? Chris - Because for a long time, we've had this concept of mirror neurons, haven't we, and people have said, when I watch someone stub their toe, hit their thumb with a hammer, or do something, the "ooh!" that I voluntarily want to say is basically me, mapping onto the same circuits in my brains if I were feeling the pain they experience. But you're saying, actually, it's more subtle than that. Anjali - Yes, because what we found is that regions when you stub your toe or you jam your finger involves some of the somatosensory regions in your brain. These are the regions that get information from the receptors at the site of injury and then tell your brain, "Wait! There's something abnormal that's happened and it's painful." But when somebody else has the same experience and you are just an observer, what you're actually doing is you are mentalising, thinking about that person's experience and cognitively deciding that that person is undergoing pain, rather than physically feeling your fingers getting hurt in some way or the other. Chris - How did you manage to dissect apart the vicarious experience of your best friend slamming her finger in the door versus what happens when you do it yourself? How did you actually manage to unpick that it's separate? Anjali - In the study, we had volunteers take part in two different sessions of an MRI experiment. Their brains were scanned when they performed two different tasks. The first task, they were given thermal pain at three different temperatures. In the second task, they were asked to view pictures of people receiving some kind of injury at three different levels - foot getting stubbed, or a hammer falling on a finger, there were some really gory ones where it looked like a chainsaw was going to cut off a finger. So, their task in the scanner was to either receive the thermal pain or view these pictures and then at the end of each trial, they rated on a scale how much sensation they felt. Now, it's very important the instructions that they were given. In the thermal pain, it was fairly obvious they felt the pain and they had to report how much pain they felt. But in the vicarious pain session, they were asked to imagine that the situation in the picture was happening to themselves and to rate how much pain or how much sensation they would have felt. Chris - Right. So we're comparing the relative activity in the brains of these individuals as they either experience pain for real themselves or they're asked to imagine how much pain another individual would be feeling. And so, you can see whether it's the same or different brain areas which are activated under those settings. Anjali - That is the general idea of the analysis. Chris - When you do this, what do you find? What do you see? Anjali - Perceiving somebody else in pain does not use the same regions in the brain as when you experience pain yourself. Instead, we use regions in the brain that are involved in understanding another person's mental state, their intentions, their preferences. So, it's something more cognitive than sensory. Chris - So, the previous idea that there was sort of a mirror circuit where you do actually superimpose someone else's pain on your own pain circuits, that's actually a myth then. You're saying that's not right. Anjali - Well, I think what we've done is we've improved upon some of those ideas and we've used more tools that are now available to us. 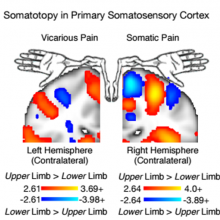 So in our earlier research, people looked at different parts of the brain independently of each other and they compared these different independent regions to come up with regions important for physical pain or vicarious pain. What we've done is we've taken a more whole brain approach to the analysis and what we've found is that we look at the whole brain, the two different experiences recruit different parts of the brain network. Chris - Is this not just a rather subtle interpretation of how we're doing brain scanning or is there a really important implication from having discovered this difference? Anjali - It's important because then you have a way to target let's say even treatment. If you know the network that is involved in physical pain, what you might do to alleviate the pain could be different from what you would've done if you know that the network was different for vicarious pain. This is just an example but it's one of the ways where knowing why there's a difference is important.